Today I am grateful for the opportunity to grow my own herbs and vegetables. I love being able to pop out into the back garden to grab a handful of coriander or sweet basil, to harvest a few fresh lettuce leaves or to pluck a lovely red chilli off a plant to spice up whatever is cooking on the stove. Freshly picked parsley is tastier than store bought, Thai basil is delicious and mint is great for garnishing cocktails or desserts in summer. It gives me immense satisfaction to watch my herbs and veggies grow – right now I’m getting ready to harvest my first batch of cherry tomatoes – and they are looking hmm hmm goood – for this I am grateful! 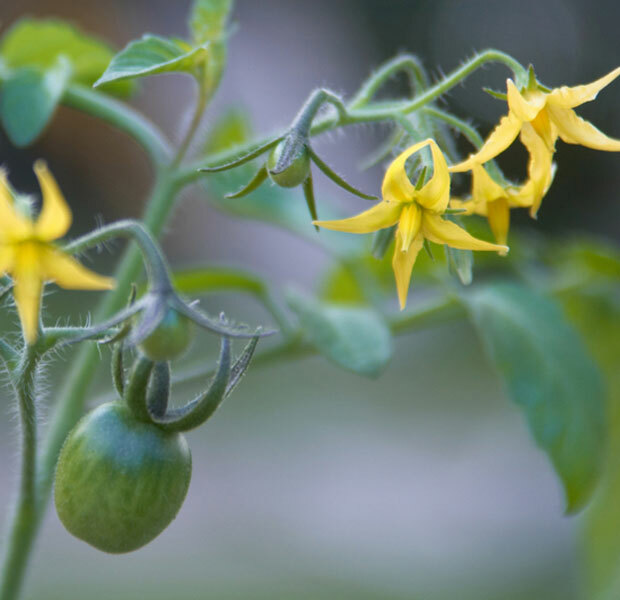 Photo – Flowers on the Cherry Tomato plant. I get just as excited about flowers on my veggie plants as I do about ornamental flowers. I think they are beautiful and they are a sign of the harvest to come. The flowers on the Cherry Tomato and the Chilli plants in particular are my favourite “veggie flowers”. Cherry Tomatoes: A cherry tomato is a small variety of tomato that has been cultivated since at least the early 1800s and thought to have originated in Peru and Northern Chile. Cherry tomatoes range in size from a thumbtip up to the size of a golf ball, and can range from being spherical to slightly oblong in shape. The more oblong ones often share characteristics with plum tomatoes, and are known as grape tomatoes. The cherry tomato is regarded as a botanical variety of the cultivated berry, Solanum lycopersicum var. cerasiforme. What a great thing to have in the garden – something we can eat!! I am also so grateful that my garden can produce incredible edibles too!